SUPERIOR, Wis. - The Forester women’s hockey team earned one point in the standings during their series at UW-Superior over the weekend (February 24-25). Lake Forest fell 2-1 Saturday afternoon and skated to a 1-1 tie with the Yellowjackets on Sunday. The Foresters finished the regular season with an overall record of 10-6-7 and a Northern Collegiate Hockey Association mark of 5-4-6. Superior is now 17-5-3 overall and claimed the regular season league title with a 9-3-3 record. After a scoreless opening period-and-a-half on Saturday, Superior got on the scoreboard at 10:10 in the second. The Foresters tied the score on a power play goal by junior Allison Rushing (Seattle, Wash./Seattle Admirals) less than two minutes later. Her seventh goal of the year was assisted by junior Laura Wilson (Corunna, Ont./Sarnia Sting) and senior Katie Snowden (Toronto, Ont./Willowdale Redwings). The game remained tied until the Yellowjackets converted a power play opportunity with just 2:40 remaining in the third period. 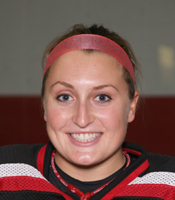 Senior goaltender Sally Bevis (Huntington, N.Y./North American Hockey Academy) and stopped 36 of the home team’s 38 shots on goal, raising her save percentage on the year to .941, the second-best mark in the nation. Freshman Ryann McCarthy (Lombard, Ill./Team Illinois) was in goal on Sunday and recorded a career-high 48 saves, the second-highest total in team history. She is now eighth in the country with a .932 save percentage and .773 (7-1-3) winning percentage. Neither team was able to in the first two periods. The home team got on the scoreboard first again with a goal at the 5:07 mark of the third. With McCarthy out of goal and just 16 seconds remaining in regulation, the Foresters tied the game on junior Courtney DeHoey’s (Chatham, Ont./Bluewater Jr. Hawks) 13th score of the season. She was assisted by Rushing and freshman Courtney Bean (Peoria, Ill./Team Illinois). Along with the NCHA regular season crown, Superior also earned the right to host the league’s O’Brien Cup Tournament next weekend (March 2-3). Lake Forest is the fourth seed and will take on the Yellowjackets in Friday’s 7:00 semifinal. UW-Stevens Point and UW-River Falls will play at 2:00 in the other semifinal. The third-place game is scheduled for Saturday at 2:00 p.m. and the championship for 6:00 that evening.